Yesterday’s signals produced a losing short trade following the bearish rejection of the resistance level identified at 1.3249. Trades may only be entered between 8am and 5pm New York time today. Long entry after the next bullish price action rejection following the next touch of 1.3165. Short entry after the next bearish price action rejection following the next touch of 1.3269, 1.3295, or 1.3332. 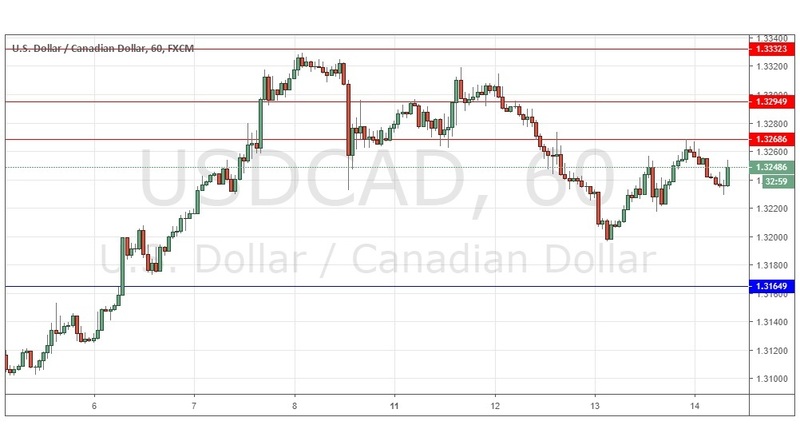 I wrote yesterday that the price was still in a medium to long-term range, and the levels still looked unreliable, so no change to my approach here for the time being – better opportunities likely elsewhere. This was a good call, as the only setup according to the key levels was a losing trade. The U.S. Dollar is still quite bullish at present, so higher prices would not be a surprise over the course of today. Much will probably depend upon the U.S. retail sales and PPI data due for release later. A short at 1.3269 after the data release could be interesting if it dovish for the greenback, but overall due to the medium-term lack of trend, I have no directional bias on this pair. There is nothing of high importance due today regarding the CAD. Concerning the USD, there will be releases of Retail Sales and PPI data at 1:30pm London time.